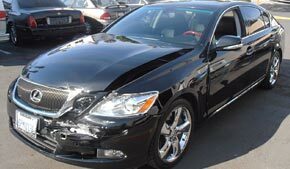 We specialize in Collision Repair, everything from a simple bumper scrape to major rebuilds costing over $40,000. We have been the repairer of choice for over 15,000 local customers, and have completed over 26,000 repairs since 1980. We are so focused on repair quality and customer service that we enjoy a nearly perfect customer satisfaction rating of 99.1% over the last 5 years. Once folks learn they have the legal right to select the repair shop (even when insurance is paying), they select us. Why? 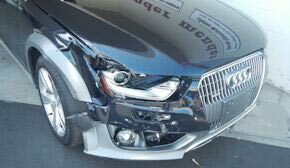 Because we are one of the few qualified auto body shops in San Diego County that does not rely on any insurance company's Direct Repair Program for referrals. So take our motto to heart: We work with your insurance company, but we work for you! When insurance is involved, you need our experts in your corner. We strive to make sure you get fair treatment from insurers, enabling us to restore your car to its pre-accident appearance, functionality and structural integrity to the highest degree possible. We work very hard to maintain our stellar reputation. Just give us a chance, and you'll find yourself joining our long list of satisfied customers! As their recommended collision repair facility, we have earned the trust of many new car dealerships, as well as major independent garages. Find your manufacturer's badge below, and see how many we've fixed just like yours! "Thank you! The car not only looks better than it did when I bought it, it drives perfectly too. I appreciate all you have done and I think you guys are great! I hope the insurance company didn't give you too much of a headache but I'm thrilled with the results." Copyright © 2000-2019 Fender Mender, Inc. All rights reserved. Learn the whole truth so you don't get pressured into a bad decision! 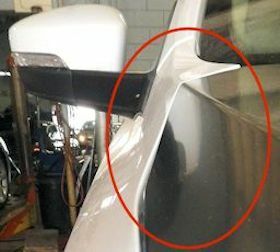 Fender Mender is not on our approved list. We do not want to be any insurer's "approved" or DRP list because that agreement would diminish our ability to restore your car to pre-accident condition to the highest degree possible. 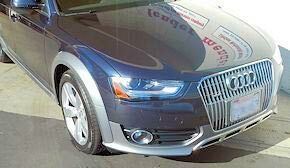 You will have to pay the difference if Fender Mender's estimate is higher than our estimate. Simply not true. We nogotiate the repair costs on your behalf so that will not happen, and that's a promise. Insurance estimates always start off low, so don't be concerned! We will not guarantee the repairs if you take your car to Fender Mender. Our guarantee is lifetime workmanship & paint, the same or better than any insurer's guarantee. And if there's ever a problem, you deal directly with us instead of an insurance company you may no longer be with. You may have to pay out-of-pocket for repairs or rental car if you use Fender Mender. We'll make sure that you owe no out-of-pocket to us unless it's for something that you want or agree to, or it's a condition of your policy (e.g. deductible or betterment). 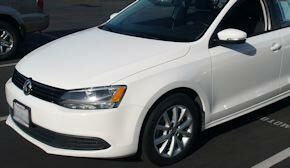 Rental car may be limited by the insurer or your policy. Your car will take longer to repair if you use Fender Mender. Possible, but not likely. What we won't do is rush your car through to save rental expense for the insurer, or to make our "cycle time" look better. We want it done right the first time. Who uses the best automotive paint available? We do! 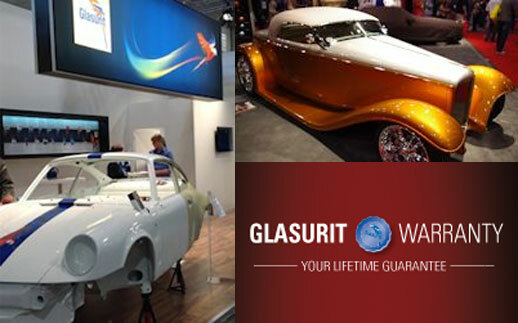 Whether it be classic cars, custom cars, or collision damaged cars, BASF Glasurit is the professional's choice-and our choice for over 30 years. Of course, there are cheaper alternatives, but we plan to be here forever, so we chose a finish to match! Why do we use BASF Glasurit? 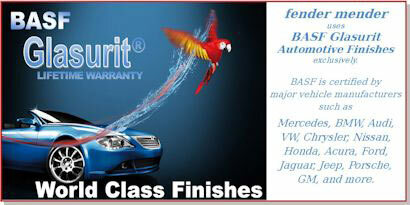 Longevity We have been using the BASF refinish line since 1980. We have tried other brands, but none have met our requirements. Manufacturer's Approvals Mercedes, BMW, Audi, Porsche, Chrysler, Ford, GM, Honda, Jaguar, and more use BASF products or approve them for field use. Waterbased Basecoats Better for the environment and better for our techs. Excellent Colormatch Some cars have a dozen or more color variances. BASF Glasurit always comes up with a perfect match. Clear urethane protective topcoats The most clear clearcoat avaliable, it does not change the actual basecoat color. Not to mention it's TOUGH! ...to the shop where they made a thorough examination of the damage and immediately started working with my insurance. Monte took care of everything and I didn’t have to lift more than a finger to sign the paperwork. Even with some delays in getting my parts from the factory, Fender Mender was able to get my car back to me on time (maybe even a few days ahead of their promised date). They were even clever enough to help me find a solution to one of my car’s less desirable factory features - a switch to disable my automatic headlamp washers. I cannot give enough praise to Monte and the whole crew for not only repairing my car to it’s pre-accident glory but also making the whole process as easy and stress free as I could imagine. A HUGE thanks to everyone at Fender Mender! ...my daughter's safety, but Monte knew what to do. Along with the aftermarket parts the insurance company specified, he took the extra time and effort to order new factory VW parts too. Then, by comparing and test-fitting the various parts, Monte showed both me and my adjuster how the aftermarket parts weren't quite as good as the Genuine VW parts. For example, the aftermarket hood didn't fit well to the fender. Neither did the aftermarket bumper. 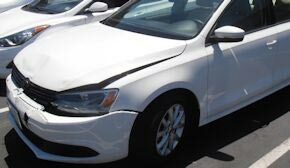 After seeing this, the adjuster agreed to pay for factory parts, and the Jetta came out looking like new. And I learned something too. When I turned-in the car in February 2015, the lease Inspector couldn't tell from looking, and said to me: "I know this car has been in an accident but I can't find it. 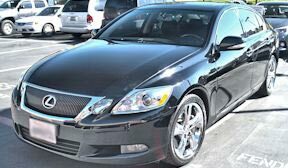 Whoever repaired this car did a very good job and paid good attention to detail". I appreciate the fact that Monte put my daughter's safety first.